Equity for Punks USA from BrewDog on Vimeo. The Scottish craftsmen at BrewDog are crowdfunding ninjaneers. These guys raise money like Chuck Norris erases bad guys, and it’s just as impressive to watch. Now, BrewDog USA will be showcasing its ever-sharp capital generating skills in America, launching its Equity for Punks crowdfunding program for craft lovers with disposable income. This happily coincides with some big changes from lawmakers when it comes to crowdfunding businesses in America. In 2010, we ripped up the rule-book and launched Equity for Punks. We invited the people who cared most about what we do to share in our future growth, and join us for a rollercoaster journey as we set about changing the UK beer scene forever. Six years and four rounds later, we have now amassed 46,000 Equity Punks across the globe. They have invested over £26m in our fledgling business and projected us to the next level both internationally and at home in our heartland of Scotland. Today, we step up our game. Today, we invite the good people of America (and the rest of the planet!) to own a share in our most ambitious project to date. BrewDog USA. Sounds cool, right? Well, some folks in Europe have been critical of the constant crowdfunding objectives of one of its new craft brewing pioneers. First off, some speculate that investors in the company will not see a return on their money, but really, that’s not a big surprise. Crowdfunding a brewery is what we call a glamour investment. Not necessarily a bad investment, but if you were really just after the financial reward, there are much better things you could be investing in. It’s a startup; it’s risky; it’s a competitive industry. No one should think they’re investing in the next Microsoft or Google. This type of investment is often about basking in the reflective glory of having a stake in a craft brewery (even if it’s one of a zillion), and that minority ownership corresponds with cool perks. Get the real lowdown on new crowdfunding laws and other slick ways to raise brewery startup capital. Other craft fans who embrace more of the small business side of the industry wonder why BrewDog wants to grow so rapidly. In fact, there’s been some backlash in Europe from craft “purists.” The company has been the fastest growing food and drinks business in the United Kingdom for the last four years, and one of the top 10 fastest growing private companies in the United Kingdom to boot. Alas, growth in America has certainly slowed for the big brewing dogs, even in craft, and BrewDog certainly appears to have its hound eyes on those leaders in the pack, but they at least have the unique angle of being a European craft beer made in America (that’s an interesting differentiator). Canal Winchester, Ohio, will be home to BrewDog’s epic new brewery. The company plans on building on 42 acres of land near Columbus. It will soon break ground on a full-scale 100,000-square-foot brewery. The site will also feature U.S. offices, a visitor center, a craft beer inspired restaurant and a taproom (DogTap Columbus). With its crowdfunding effort, BrewDog wants to grow even more regionally. The company is looking to open some “awesome BrewDog beer bars” across the United States. You can actually keep track of its progress across America over on this live updates page. You can buy a part of BrewDog USA for just $95. Investing in BrewDog USA brings with it a raft of benefits as well as an equity stake in our business. You’ll have your say in how our company is run, as well as the opportunity to attend our USA AGM (a music, beer and food party, exclusively for Equity Punks), and claim awesome perks like growlers, super rare beers and tours & tastings with our team. Check out this page to read about all the benefits of investing in BrewDog USA. 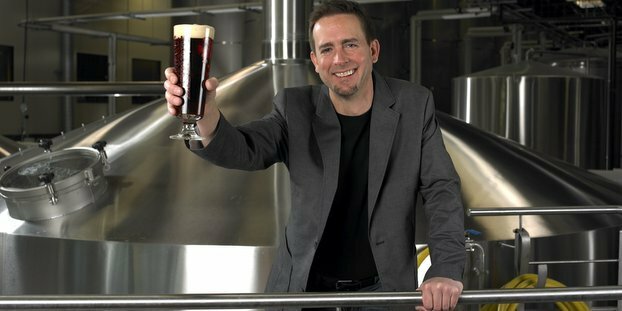 The company’s aiming to raise up to $50 million by selling 1,052,632 shares of Common Stock in BrewDog USA Inc. The offer is open to anyone who wants to invest, anywhere in the world, as long as it is legal in their country. Shares cost $47.50 each, and the minimum investment is two shares ($95). Jeff Platt liked this on Facebook.